Sarah Green (Sg), is the founder and front person of the melodic, three-piece, post-grunge band, Spare Parts for Broken Hearts. Known for their unique blend of big and beautiful choruses soaring above the heavy pulse of distorted drive, Spare Parts is a nostalgic nod to the beloved dynamic of classic ‘90s fuzz-drenched melodies, often soaked in the angst of its tortured storyteller. 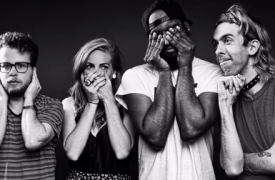 The band is reminiscent of many post-grunge era greats, but with a modern and memorable kick to the teeth. LA Record has said “In an era of music characterized so frequently by pastiche delivered with a sly wink, it’s refreshing to hear a band utilize and own their influences this sincerely,” After Ellen said “Sg’s voice is going to become your new favorite sound” and The Orange County Register has dubbed them “An ardent testament to true alternative rock music.” After returning from another Van’s Warped Tour in 2010, Green made plans to start the Long Beach based trio doubling as both singer/guitar player while also frequently alternating on bass. The inception of Spare Parts was the culmination of Green’s diverse roster of musical endeavors as both a multi-instrumentalist and solo artist; this became the catalyst for Green to eventually sum all of them up into one core project and create a band of her own. Green dropped out of college and came out the same year she jumped on the Van’s Warped Tour for the first time, touring as a bassist and traveling alongside bands such as CKY, Weezer, The Muffs and Thursday. 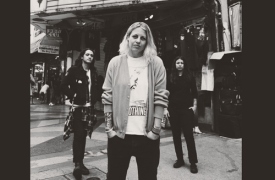 Upon returning, Green’s interest in activism within her own LGBTQIA community became the fundamental root of what would later become the core foundation Spare Parts for Broken Hearts is built upon, noting the band’s tagline, “Everything Heavy, Everyone Here.” In 2018, Green rounded out a new lineup with long-time fan, Jonny Cifuentes (bass) and long-time friend, Jessica Lankford (drums). With a recent relocation of the band to Echo Park, Green and Spare Parts for Broken Hearts are manifesting a year of new beginnings. To welcome their first official hometown show, Grimy Goods named them “One of the 15 must see bands of Echo Park Rising 2018.” Spare Parts began recording earlier this year with plans to release another single in the Fall. What began as an EP, will likely become a full length release to follow in 2019. A rock and roll spirit with a soulful tone, she holds nothing back from her audience and leaves everything on the stage. 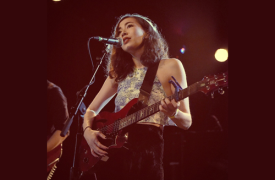 Raised in Southern California, Nicole has developed her sound on stages all across Los Angeles, from the Viper Room, to Harvard and Stone, Resident LA, and Hotel Cafe. She draws from influences in classic rock, folk, and musical theatre; and is currently wrapping up her first studio album, titled ‘Matte Black,’ set to release in 2018. Her melodies are musical cathedrals, with lyrics that both cut and heal. Her songs are fearless reminders that rock and roll was born in the rhythm, and the blues.